One of the bright spots in the current motorcycle scene is the popularity of urban assault vehicles. The cafe racer look and its offshoots, bobbers and brat bikes, has been around for some time now, and the style has proved its staying power. As a result, lightweight, powerful motorcycles with excellent handling to meet the demands of urban riders are appearing in the lineup of many of the OEMs. New entries in this category are Husqvarna’s Vitpilen and Svartpilen, single-cylinder machines with ultramodern styling. “We started with the cafe racer look, but wanted to design something that was very modern and futuristic,” said Blaine Schuttler, managing director for Husqvarna North America. Although Husqvarna is now known for its competitive enduro machinery and well-regarded motocross and supermoto offerings, in the days of yore, the company not only had a full line of road-going motorcycles, but competed in Grand Prix road racing events. This company, based in Sweden for most of its existence, built its first motorcycle in 1903 and started racing seriously after World War I. Between 1931 and 1935, the company built winning Grand Prix bikes. Starting in the 1960s, Husqvarna’s lightweight two strokes cleaned up in motocross and Baja 1000 events. Today, the company is partnered with KTM and producing motorcycles in Austria, while continuing its winning ways in the dirt. One of the fastest growing motorcycle companies, Husqvarna has doubled sales in three years, with one-third of its production going to North America. Going full circle, Husqvarna is now on the road again. The 401 Svartpilen (Swedish for “black arrow”) and Vitpilen (“white arrow”) made their debut in prototype form at the 2014 EICMA (Milan) motorcycle show and caused a big stir. Then potential buyers waited … and waited … and waited. The wait is now over and customers will see the bikes on the showroom floor. The 701, a larger version of both bikes powered by the same engine slotted into the KTM Duke 690, debuted at the 2017 Milan show. 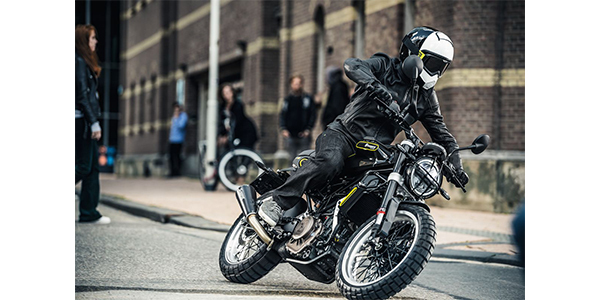 The Svartpilen is inspired by Husqvarna’s Scrambler. The bike sports a more rugged look than the Vitpilen, down to the Pirelli Scorpion dual sport tires. 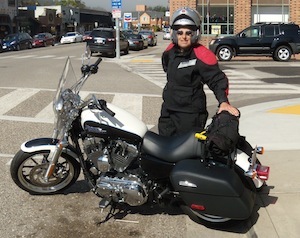 It also has a more upright riding position, an advantage when splitting lanes and maneuvering through rush hour traffic. Schuttler explained that the bike is intended as an urban “Mad Max” machine, good for weekend exploration on gravel roads and dirt roads and commuting on torn-up pavement. The target consumer for all four bikes is a new or returning rider, possibly with an off-road background. “It’s a cost-effective, affordable bike,” Schuttler said. The bikes were designed for a 20-something or 30-something who is interested in the latest fashion and trends, but who doesn’t have an unlimited budget. Power-to-weight ratio is more important to an urban rider than top speed, although both of the smaller bikes will do the ton easily. Interestingly, a lot of the comment generated by the bikes has been published in non-motorcyling media, showing that the bikes have appeal outside the motorcycle community. Both Men’s Journal and the LA Times published very positive reports about the Vitpilen and Svartpilen. Schuttler is aware that most Husqvarna dealers are in rural or suburban areas, far from the urban centers where the Vitpilen and Svartpilen target consumer lives. “We are planning on expanding to the top 40 U.S. and Canadian markets,” Schuttler said. The company now has a three- to five-year plan to implement its expansion.